Ecko is looking for designs to be included in the Ecko Unlimited Spring 2010 Collection. Calling all artists for submission. Deadline: May 8, 2009. Ecko Unltd. is driven by a simple belief: that no one needs to be corralled into a single aesthetic viewing the world with a voracious curiosity, finding inspiration at every turn. With sales around the world in countries full of youth with artistic talent and passion - the time has come to open our apparel collection to new artistic palettes. If you have the talent - This is your chance to take part in the first Ecko Unltd. Global Art Battle. 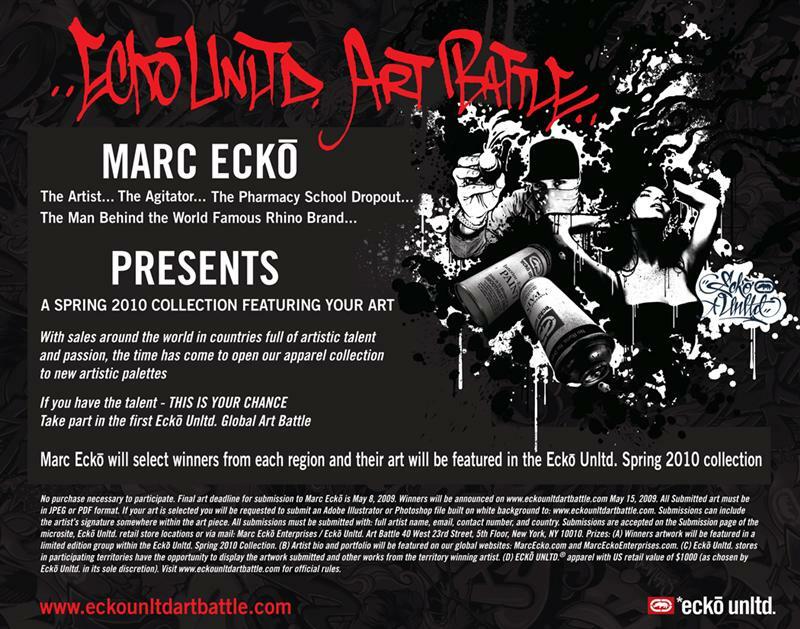 Marc Ecko will select winners from each region and their art will be featured in the Ecko Unltd. Spring 2010 collection. For complete rules and submission guidelines, please check out: http://eckounltdartbattle.com/ or call 636-32-76 local 124.